Charlie is 21, lives in Brixham and is making a career in the marine industry. We first met Charlie when we sailed onboard Trinity Sailing’s gaff trawler Leader from Brixham to Falmouth recently – read about it here. Growing up between Lanzarote and Swanage, Charlie learned to sail dinghies before taking part in a sail training voyage with the Rona Trust back in the UK aged 14. This introduced her to the world of big boat sailing, inspiring Charlie to take it further. Charlie now has her RYA Coastal Skipper and a foundation degree in Yacht Operations, and lots of experience sailing different kinds of yachts. She’s going to top up her degree later this year, alongside running her own yacht cleaning company based in Brixham… the name of her company? Salty Suds, of course. Charlie has just come back from her latest adventure, and we were pretty excited to hear about it, and wanted to share it with you here. The adventure? 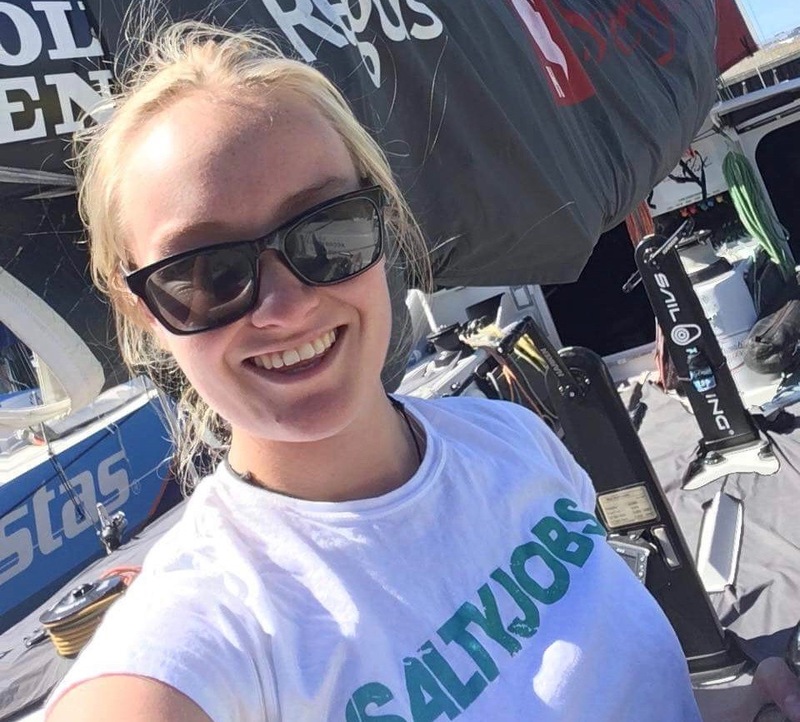 Charlie sailed aboard the Volvo Ocean 65 yacht Scallywag as part of a delivery crew – her first ever ocean racing yacht experience. Hi Charlie! What’s your latest adventure – we hear something about Scallywag? Yes – I’ve just completed a delivery onboard the Volvo Ocean 65 racing yacht Scallywag, from The Hague in Holland, down to Lisbon in Portugal. We sailed just over 1,300nm and the trip took about 5 days. 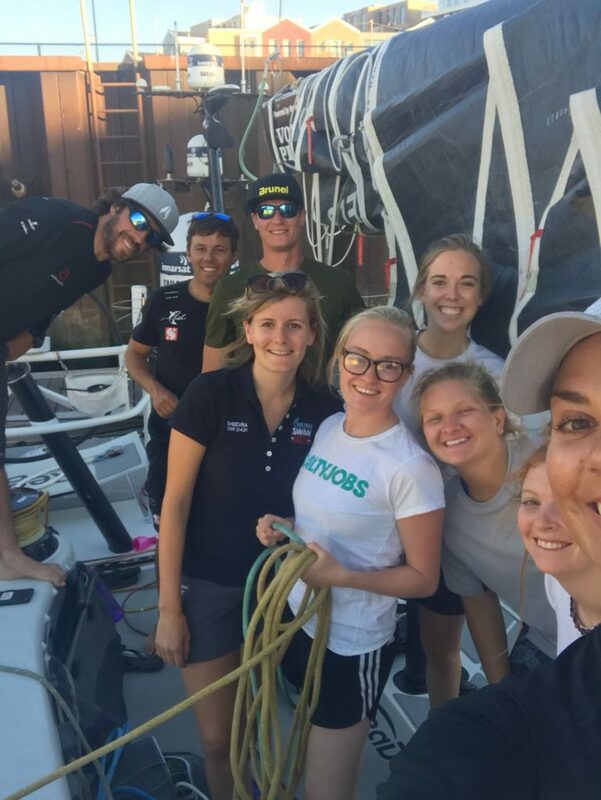 There were 11 of us onboard – including five girls from The Magenta Project. That sounds amazing. How did you come across the opportunity? I”d been in contact with The Magenta Project before. Whilst at uni, I sent my CV to all the maritime related organisations I could find – from sail training to Volvo Ocean Race teams. I sent it out to about 80 different places. The Magenta Project responded – they are a charity promoting women across all areas of sailing. I kept in touch with one of the founders, who herself was on the Volvo team. A week before the trip, they contacted me – and that was my opportunity to join Scallywag for the delivery. Your proactive attitude definitely paid off. Who were the other crew? We had a great mix onboard – a lady called Sarah, she flew in from America. 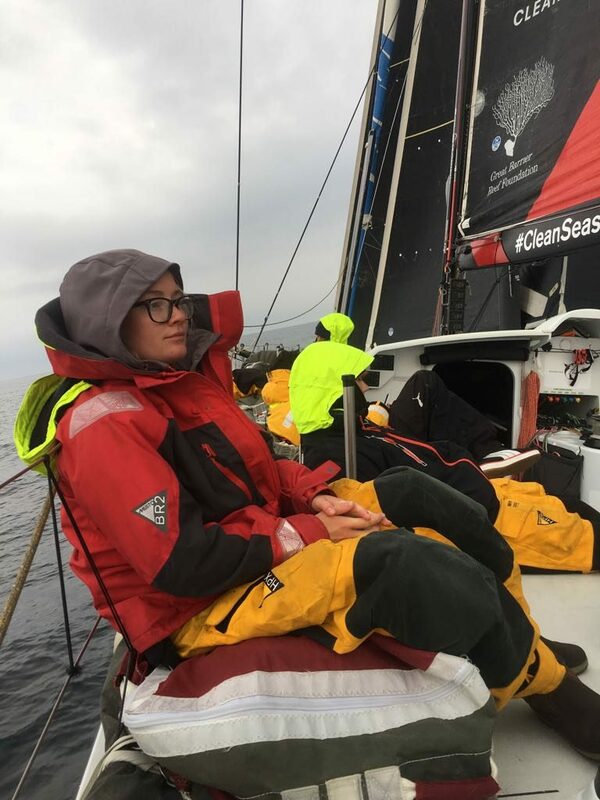 Sarah was crew onboard the last Volvo Race. Our skipper was one of the crew members who had raced onboard Scallywag. A couple of the guys were from Team Brunel. There were 11 of us onboard in total, including 6 ladies, and 5 men. One travelled for 30 hours, flew into Amsterdam, arrived, slept for 6 hours, met her on the train, went sailing, two days in Portugal and flew home. She’d never been to Europe. One came from America, the coach came from America, and two girls from Oxford, they’d done a lot of racing before. What was the sailing like? The sailing side of it, I’ve never sailed that intensely. We were split in half for watches – 5 & 6 on each, with 4 hours on and 4 off. We were very fortunate with the weather – it was quite light airs. The first 24 hours running down across the North Sea, to gybe the boat, everyone needs to be on deck. If you were off watch you’d be woken up, I was woken up every 30-45 minutes to gybe. 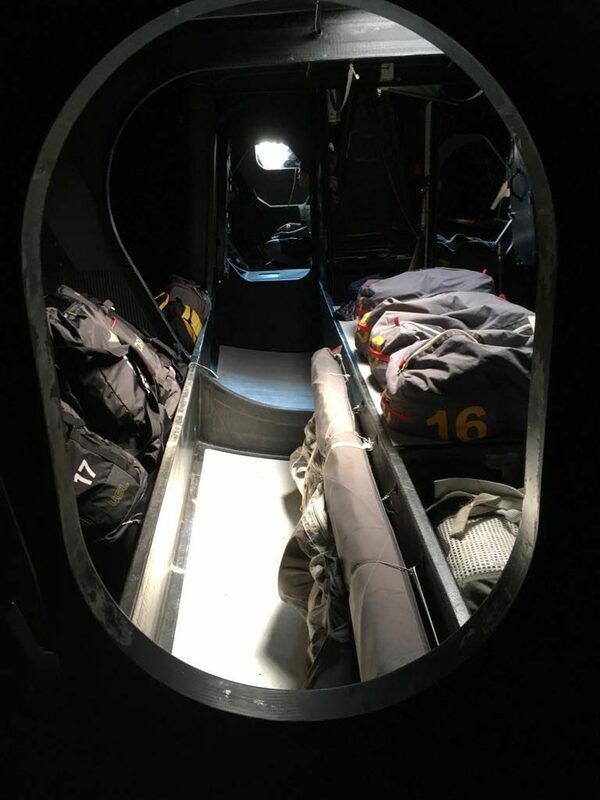 To go back down below and sleep was hard – you couldn’t sleep in your kit, as we were all sharing bunks so had to be considerate. It was only 12 hours but to think of doing that across the whole Southern Ocean is crazy. How does a Volvo Ocean 65 compare to the boats you usually sail on? Going from Leader [a 1892 105ft gaff ketch], the last boat I sailed on, Leader was really nice down below. You go down below on Scallywag and they’re like this is the galley, and the galley is tiny, a sink, and a hob. Freeze-dried food. Freeze-dried food – what was that like? It was my first experience cooking and eating it. 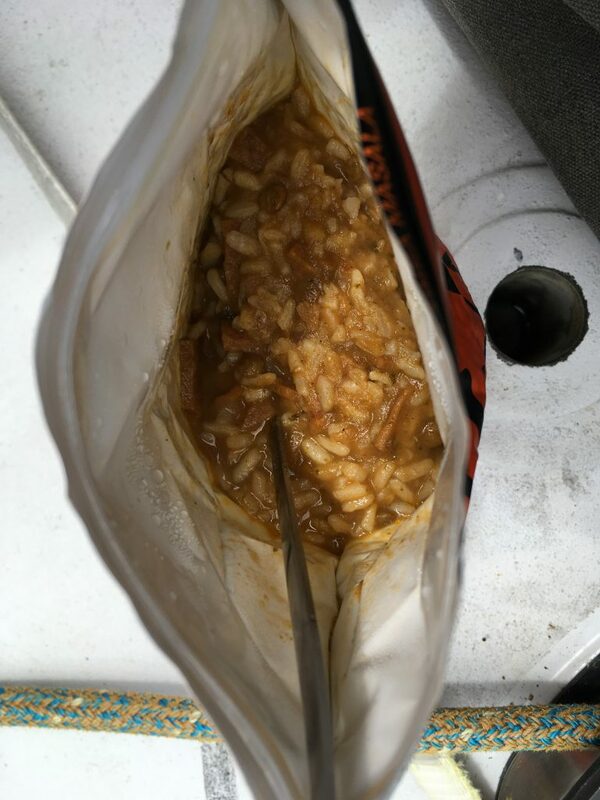 You have a bag of… boil the kettle, pour the water in, wait 10 minutes, rehydrate the food. Felt like an astronaut. Except we had all the leftovers from the race, so some of it was really vile – rehydrated scrambled eggs and noodles. The chilli con carne was really nice, I enjoyed that. And chicken and dumplings. 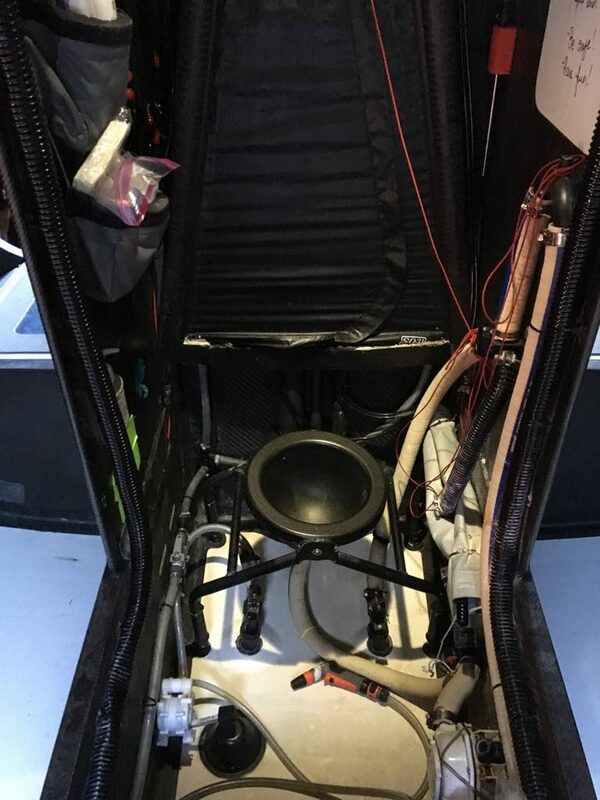 We often see photos of swanky nav gear and chart tables on ocean racing boats. Did it live up to expectations? 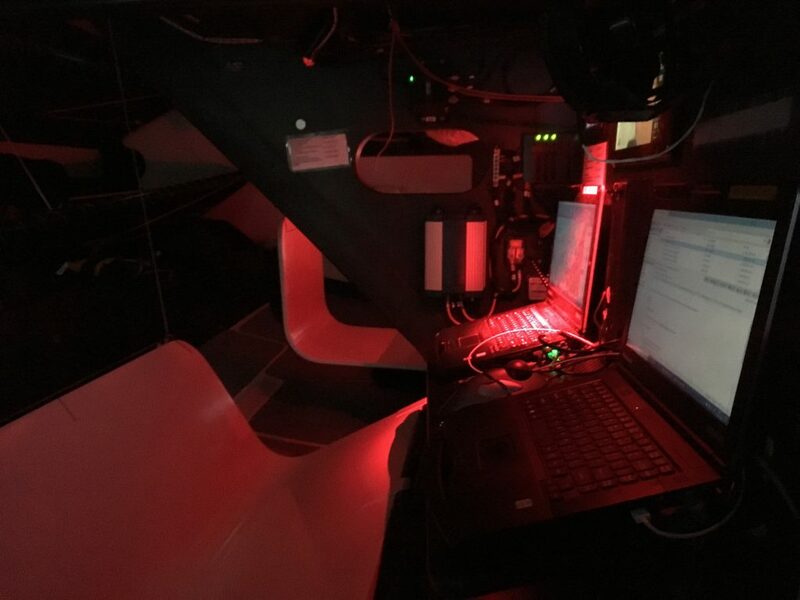 The nav station – well, despite the fact that lots of the equipment had been removed, there were still 3 laptops plus all the usual nav equipment. The crew use it for things like downloading GRIB files for the weather. And we have to ask – the heads experience? That’s brilliant – clipped on of course – sounds like a new personal best! Other than the heads, how was it a different experience to the sailing you usually do? Everything was so well structured. It ran so smoothly as a boat. I come from a sail training background where nothing works and the crew are novices. It was amazing to sail with a crew who knew what they were doing. 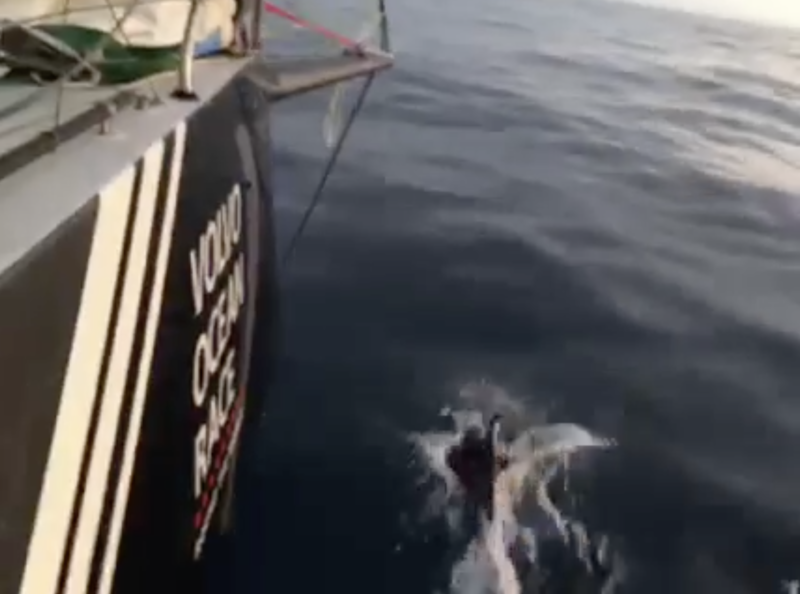 It really opened the door to the idea that doing a Volvo Ocean Race would be possible. So it inspired you – but also showed you that it was possible. 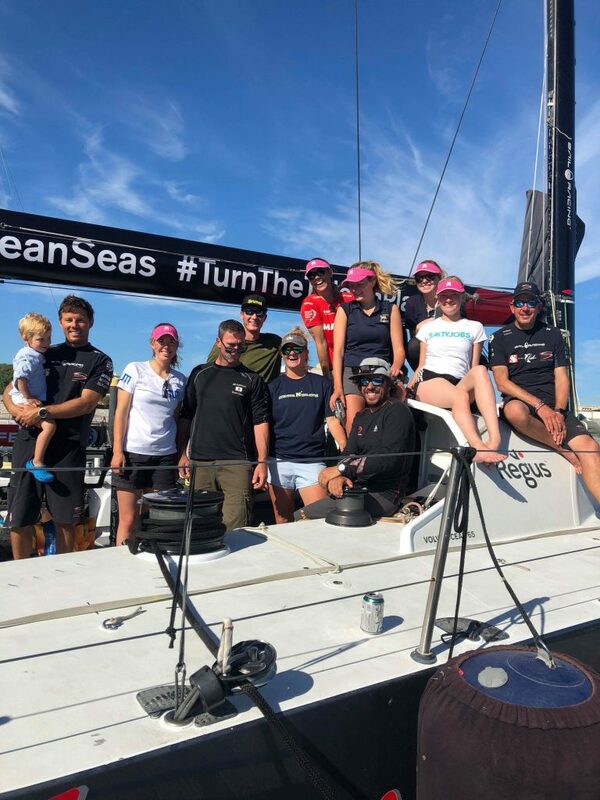 What do you think of the ocean racing now? It definitely opened up another area of the industry. Even just the whole racing element. The logistical, organisational side, the shore crew, guys who prep the boats and run the boatyards for the refit. Listening to the intense amount of work, fundraising and advertising that goes into everything. Even if you’re not one of the 12 people onboard, there’s so much support that goes on behind the scenes. Sounds like a few salty jobs there! Did you end up making good connections with the rest of the crew? Yes. We’re going to keep in touch. They are so fab. I’m going to try to get to Sydney to see one of them. The Magenta Project are just amazing. They push women so much, in an environment which is still really male dominated. Would you like to crew onboard the Volvo Ocean Race then? We can’t wait to follow Charlie as her adventures progress and she works towards her dreams. 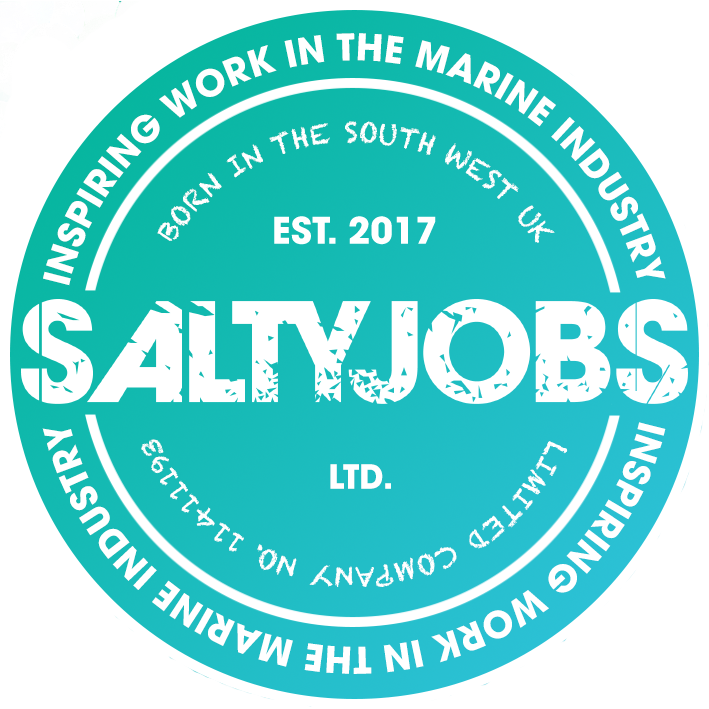 In the meantime, if you have a boat in Brixham, contact Charlie through her business Salty Suds for the best boat cleaning services.